Front Syst Neurosci. 2013 Aug 30;7:45. Jankowski MM, Ronnqvist KC, Tsanov M, Vann SD, Wright NF, Erichsen JT, Aggleton JP, O’Mara SM. Trinity College Institute of Neuroscience, Trinity College Dublin Dublin 2, Ireland. The anterior thalamic nuclei (ATN), a central component of Papez‘ circuit, are generally assumed to be key constituents of the neural circuits responsible for certain categories of learning and memory. Supporting evidence for this contention is that damage to either of two brain regions, the medial temporal lobe and the medial diencephalon, is most consistently associated with anterograde amnesia. 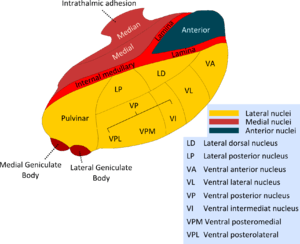 Within these respective regions, the hippocampal formation and the ATN (anteromedial, anteroventral, and anterodorsal) are the particular structures of interest. The extensive direct and indirect hippocampal-anterior thalamic interconnections and the presence of theta-modulated cells in both sites further support the hypothesis that these structures constitute a neuronal network crucial for memory and cognition. The major tool in understanding how the brain processes information is the analysis of neuronal output at each hierarchical level along the pathway of signal propagation coupled with neuroanatomical studies. Here, we discuss the electrophysiological properties of cells in the ATN with an emphasis on their role in spatial navigation. In addition, we describe neuroanatomical and functional relationships between the ATN and hippocampal formation.